Legend has it that when the princess kissed the ugly frog it turned into a handsome prince and they lived happily ever after. 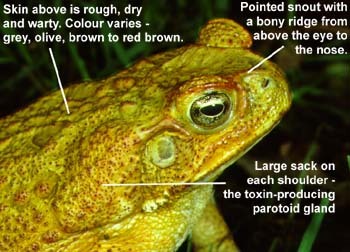 In truth, there is a toad (which looks like a frog, but is usually larger and typically flat and round) that is POISONOUS and potentially deadly to your pet. Bufo toads, officially known as Bufo Marinus, are native to South America and were brought in by the pet trade. In the wild, they grow to be about the size of a softball, but with the good sources of protein -like dog food- they can grow to dinner-plate size. Their slow hopping movements attract curious dogs. When threatened they secrete a whitish-yellow toxin from their salivary glands, located behind their ears. When a dog gets any of this toxin in their mouth from either licking, mouthing or biting the toad, the dog will salivate profusely and the gums will get very red in appearance as the toxin irritates the sensitive mucosa of the gums. The poison can cause many symptoms, such as, hyper salivation or foaming from the mouth, slow heart rate or even seizures. The poison is very toxic and can be fatal. In order to save your pets life, it is essential that you act immediately. DO NOT ATTEMPT THIS IF YOUR PET IS EXPERIENCING A SEIZURE!!! Rinse your pets mouth with running water, hold the head down and flush from side to side or side to front, avoid spraying water directly into pets mouth. TRY NOT LET YOUR PET SWALLOW THE WATER! Gently wipe the gums with a wet cloth in an attempt to remove as much toxin as possible. CALL your veterinarian during regular business hours or the emergency clinics ( 434-5700 or 691-9999) if it is after hours. DO NOT DELAY! MINUTES COULD BE THE DIFFERENCE BETWEEN LIFE AND DEATH! It takes less than 20 minutes from the time the toxin is ingested to full blown, life threatening symptoms. Keep your pet leashed when outside especially during rainy season at dusk or dawn. Do not let your pet root around in bushes or near standing water. Dark moist areas are their favorite places to call home! © 2008 - 2019 All Paws Animal Clinic, Inc. All rights reserved | Designed by Green Group Studio, Inc.